Collective Impact as a tool to bring about community change has seen remarkable growth in usage since 2011. Collective Impact has been used successfully with a variety of local issues and has raised the consciousness of how community groups interact as well as the approaches that can lead to long-term innovations. This edited volume sets forth conceptual foundations for using Collective Impact as well as sharing basic approaches that have succeeded in projects under diverse circumstances. It will be useful for both academics and practitioners as Collective Impact continues to undergo substantial changes in focus and direction. Building on Kania and Kramer’s influential work, it provides readers with detailed insights not only into how the Collective Impact system works but also innovative applications to issues facing community developers. The diverse topics shared by the contributing authors make this volume especially important for practitioners designing programs to bring about long-term changes in their communities. Including discussion about how Collective Impact has succeeded in different governmental settings, this book demonstrates how Collective Impact has been modified to accommodate the associated cultural differences with 10 chapters written by experienced on-the-ground community development experts. Norman Walzer, PhD, is Senior Research Scholar in the Center for Governmental Studies at Northern Illinois University, DeKalb, Illinois. 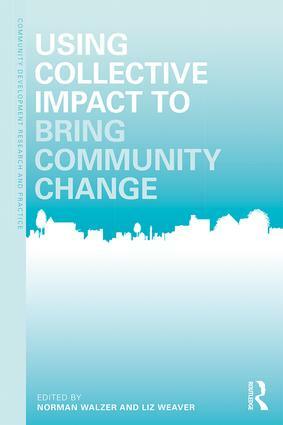 He co-edited a previous research volume on Collective Impact and community development issues. He also has actively researched local economic development issues including community supported enterprises as well as the impact of governmental structure on local public finance. Liz Weaver, BA, MM, is Vice President and Director of Operations with Tamarack Institute. Liz provides strategic direction to the organization and leads many of its key learning activities including Collective Impact capacity building services for the Ontario Trillium Foundation. She is a nonprofit organizational professional with experience in leading cross-sector, place-based collaborations on poverty at local and national levels. This series serves community developers, planners, public administrators and others involved in practice and policy making in the realm of community development. Building on a 40 year history of publishing the journal, Community Development: Journal of the Community Development Society, the book series seeks to contribute to the growing and rapidly changing knowledge base as a resource for practitioners and researchers alike. To find out more about the Community Development: Journal of the Community Development Society please visit: www.tandfonline.com/rcod.